How are you preparing your heart for Christmas this year? 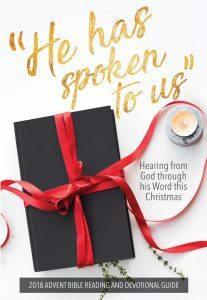 “He has spoken to us,” Advent Bible Reading and Devotional Guide written by Pastor Craig, will provide biblical heart preparation as we approach Christmas. Booklets are available at the Info Desk. You can also click here to download a copy of the entire devotional, subscribe to our Advent Daily Email, or read it daily at ICommendJoy.com. Pick up a copy to help you magnify the Lord in your heart! The choir, orchestra, and praise teams presented a collection of Christmas favorites on Sunday, December 16 at 9 a.m. and 10:45 a.m.. If you missed it, you can watch and listen to it online. The worship service on Sunday, December 23 will be a simple time of worship at 9 a.m. and 10:45 a.m. and will consist of traditional Christmas carols led by a piano and organ as well as a time of teaching. Traditions will meet as normal. Bethel Kids will have Sunday School for Infants up to 4 Year Olds (Bees Class). Activity Boxes will be available by the Worship Center Doors for older kids. The Christmas Eve Candlelight Service will be at 3:30 p.m. and 5 p.m. on Monday, December 24. The service will be a beautiful time of worship for the entire family and will include carol singing, some special presentations by our worship ministries, and a devotional. The service will end with the congregation singing “Silent Night” under the illumination of traditional candlelight. 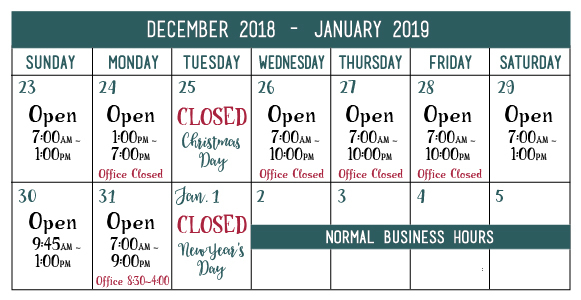 The week after Christmas our hours will be adjusted. We put together this calendar to help with that in case you’re planning a visit to the church that week. In case of emergency and need of a pastor, contact 701.232.4476. The worship service on Sunday, December 30 will be a simple time of worship at 10:45 a.m. only and will consist of traditional Christmas carols led by a piano and organ as well as a time of teaching. Traditions will join Live in the Worship Center. Bethel Kids will have Sunday School for Infants up to 4 Year Olds (Bees Class). Activity Boxes will be available by the Worship Center Doors for older kids.